A cool tube from Safari that offers ten samples of fossils that you might find on a dig. These are about 2 inches in length and are really nicely done. 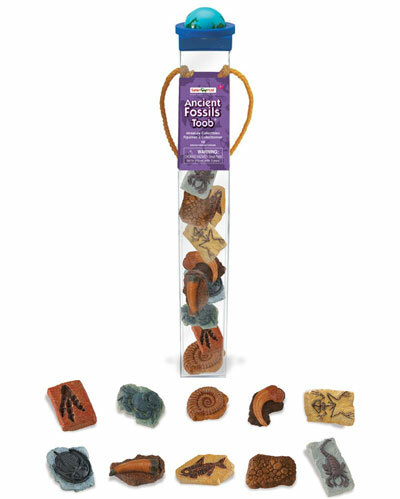 Included in the tube are: an ammonite, dino footprint, dinosaur skin, eurypterid, fossilized fish, fossilized frog, giant crabs, velociraptor claw, tyrannosaurus rex tooth, and a trilobite. Tags: eurypterid, safari, trilobite, velociraptor.